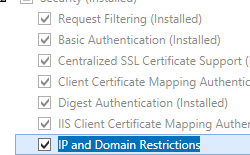 The <ipSecurity> element defines a list of IP-based security restrictions in IIS 7 and later. These restrictions can be based on the IP version 4 address, a range of IP version 4 addresses, or a DNS domain name. 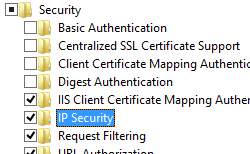 IIS 10.0 The <ipSecurity> element was not modified in IIS 10.0. IIS 8.5 The <ipSecurity> element was not modified in IIS 8.5. 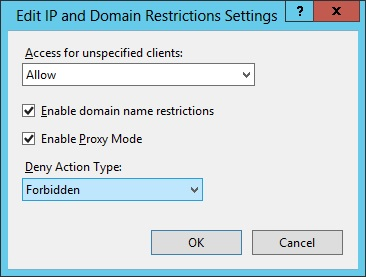 IIS 8.0 The enableProxyMode attribute was added to enable you to block requests from a client that connects through a proxy. 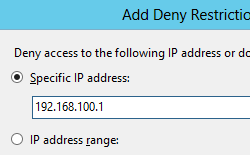 The denyAction attribute was added to specify the default deny mode response that IIS sends back to clients. 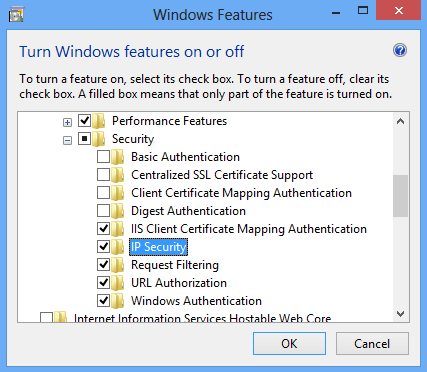 IIS 7.5 The <ipSecurity> element was not modified in IIS 7.5. 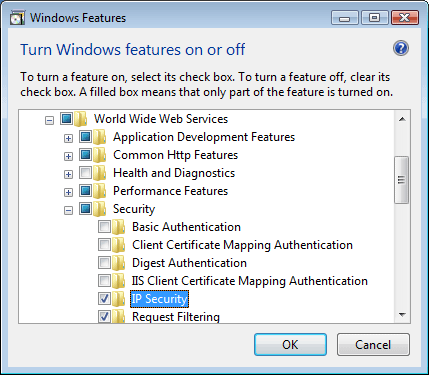 IIS 7.0 The <ipSecurity> element was introduced in IIS 7.0. 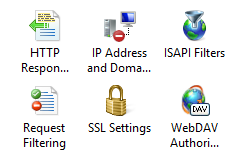 IIS 6.0 The <ipSecurity> element replaces the IIS 6.0 IPSecurity metabase property. Expand Internet Information Services, expand World Wide Web Services, expand Security, and then select IP Security. 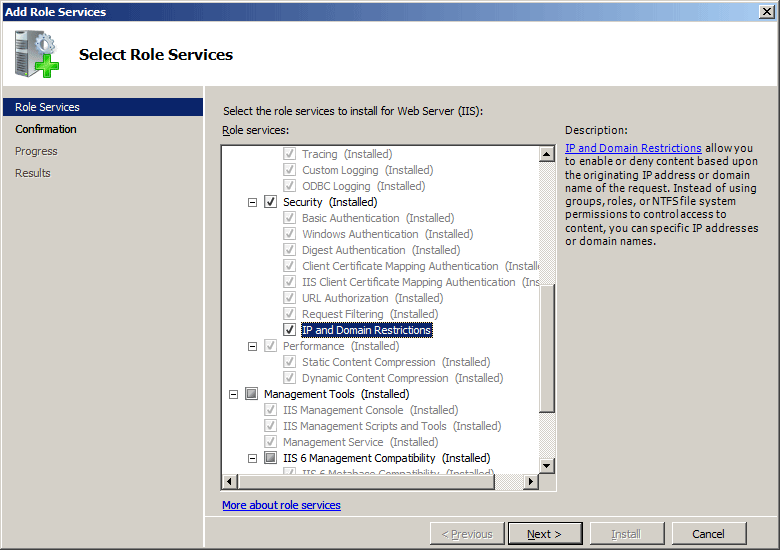 On the Select Role Services page of the Add Role Services Wizard, select IP and Domain Restrictions, and then click Next. Expand Internet Information Services, then World Wide Web Services, then Security. Select IP Security, and then click OK. 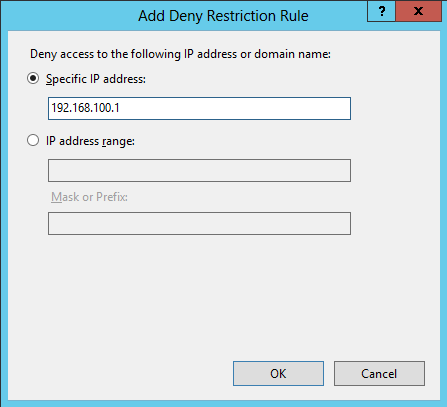 In the IP Address and Domain Restrictions feature, click Add Deny Entry... in the Actions pane. In the IP Address and Domain Restrictions feature, click Edit Feature Settings... in the Actions pane. 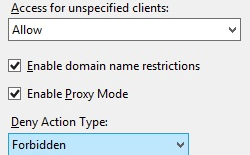 Choose the default access behavior for unspecified clients, specify whether to enable restrictions by domain name, specify whether to enable Proxy Mode, select the Deny Action Type, and then click OK.
Rules are processed from top to bottom, in the order they appear in the list. The allowUnlisted attribute is processed last. Best practice for Internet Protocol security (IPsec) restrictions is to list Deny rules first. You cannot clear the allowUnlisted attribute if it is set to false. 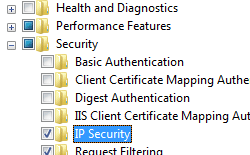 The following default <ipSecurity> element is configured in the root ApplicationHost.config file in IIS 7 and later. This configuration section inherits the default configuration settings unless you use the <clear> element. 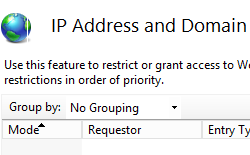 Specifies whether to allow unlisted IP addresses. Setting the allowUnlisted attribute to true allows an unlisted IP address to access the server. Setting the allowUnlisted attribute to false locks down the server, preventing access to all IP address unless they are listed. If you were to set this attribute to false and do not list the local loopback address (127.0.0.1) as an allowed IP address, you would not be able to access your server by using a browser from a local console. Specifies the default deny mode response that IIS should send back to clients. The default value is forbidden. Specifies that by default IIS should send a deny mode response of Abort back to clients. Specifies that by default IIS should send a deny mode response of Unauthorized back to clients. If a browser-based client is being used at the remote end, returning Unauthorized may cause an authentication dialog to appear at the remote client, resulting in spurious authentication attempts to IIS. The numeric value is 401. 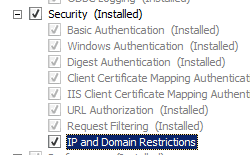 Specifies that by default IIS should send a deny mode response of Forbidden back to clients. The numeric value is 403. Specifies that by default IIS should send a deny mode response of Not Found back to clients. The numeric value is 404. 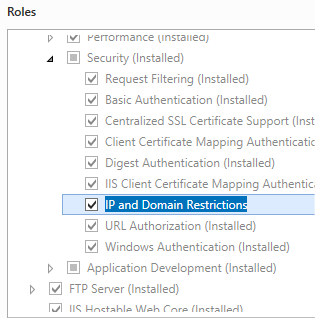 Enables IIS not only to block requests from a client IP that is seen by IIS, but also to block requests from IP addresses that are received in the x-forwarded-for HTTP header. This header enables you to identify the originating IP address of a client that connects through an HTTP proxy or load balancer. This is referred to as proxy mode. Caution: Reverse DNS lookups will use significant resources and time. Removes a reference to a restriction from the <ipSecurity> collection. Removes all references to restrictions from the <ipSecurity> collection. 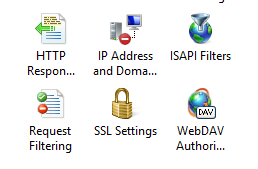 The following configuration sample adds two IP restrictions to the Default Web Site; the first restriction denies access to the IP address 192.168.100.1, and the second restriction denies access to the entire 169.254.0.0 network. The following code samples enble reverse DNS lookups for the default web site.